As GDC 2018 rolls on this week, NVIDIA has released driver version 391.24 WHQL, featuring Game Ready support for the recently released Sea of Thieves, as well as a range of bug fixes. This latest patch also brings support for the latest GeForce Experience 3.13.1, which comes with several new updates announced at GDC. Among them, NVIDIA Highlights takes center-stage with support for more games and new 'Save as GIF' feature. 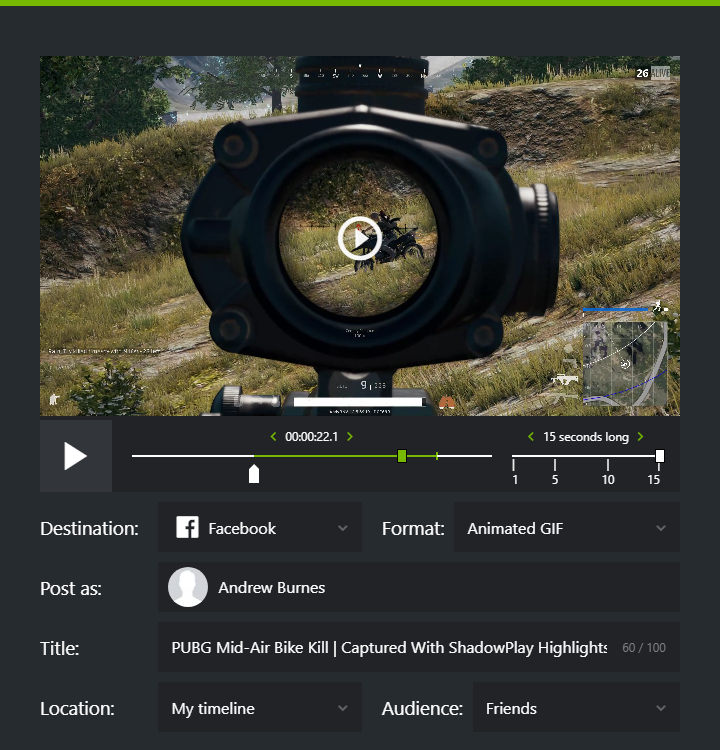 Previously known as 'ShadowPlay Highlights,' NVIDIA Highlights is the company’s game recording feature for automatically capturing instant replays and clips in supported games. Debuting last summer with LawBreakers support, ShadowPlay Highlights has been quietly rebranded to NVIDIA Highlights, though there is no indication that ShadowPlay integration has changed; to note, NVIDIA has gone back and changed many prior mentions of 'ShadowPlay Highlights' to NVIDIA Highlights. In any case, this week at GDC they are announcing several updates. Tekken 7 has added Highlights support, with an upcoming Call of Duty: WWII update to add support as well. Highlights support will also be coming to Escape from Tarkov and Dying Light: Bad Blood. The Highlights application is getting some new functionality as well. Recordings (Highlights or standard ShadowPlay video) can now be shared as up to 15 second-long GIFs on Facebook, Google Photos, and Weibo. Opening a clip with Alt+Z and selecting the Animated GIF option brings up settings to adjust duration, end points, posting options, and more. The actual process for adjusting Highlights auto-recording parameters has also been streamlined, with a Highlights options menu through the Alt+Z overlay Settings cog. On the developer side, NVIDIA released a public NVIDIA Highlights SDK, and is bringing support to Unreal Engine and Unity via Highlights plug-ins. 391.24 also adds 'Old-Film' and 'Tilt-Shift' filters for NVIDIA Freestyle, a feature that adds selected post-processing filters onto games in real time. Additionally, NVIDIA Ansel support has now come to Star Wars Battlefront II (arcade mode), Kingdom Come: Deliverance, Q.U.B.E. 2, and Pure Farming 2018. 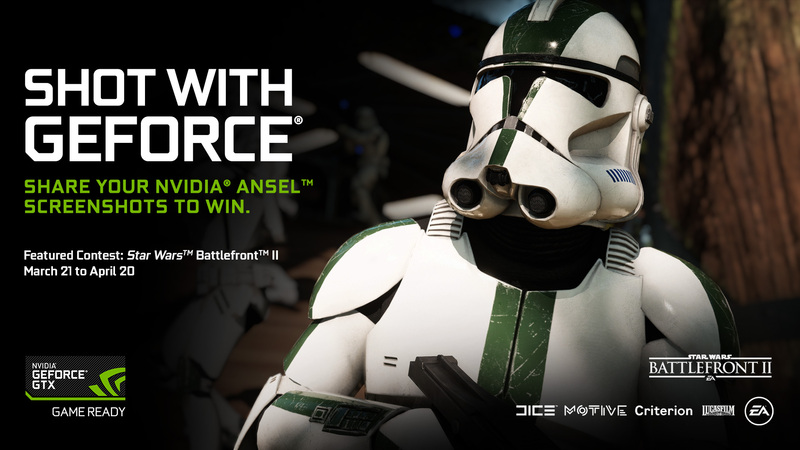 NVIDIA is also introducing a new 'Shot With GeForce' web gallery that gamers can upload Ansel images to. HTC Vive or Oculus Rift stops working after several launches of an application or after resume from system Hibernate mode. When launching a video on Media Player Classic Home Cinema (MPC-HC), the system stutters momentarily. Blue-screen crash may occur when installing the driver on Surface Laptop. For Volta GPUs, the display flickers continuously after disabling and enabling the GPU using Device Manager, or when rebooting the system. Flickering/corruption occurs on GeForce GTX 1060 when opening the Rise of the Tomb Raider options UI in-game. The updated drivers are available through the GeForce Experience Drivers tab or online at the NVIDIA driver download page. The latest GeForce Experience client can also be found separately on its own download page. More information on this update and further issues can be found in the 391.24 release notes. Damn, I have the laptop with 3D vision, after update - it is not working anymore! Also, the printer is not recognizing now `cose there some conflict between drivers.